Polbase - Reference: Bypass of Aflatoxin B(1) Adducts by the Sulfolobus solfataricus DNA Polymerase IV. Bypass of Aflatoxin B(1) Adducts by the Sulfolobus solfataricus DNA Polymerase IV. Aflatoxin B(1) (AFB(1)) is oxidized to an epoxide in vivo, which forms an N7-dG DNA adduct (AFB(1)-N7-dG). The AFB(1)-N7-dG can rearrange to a formamidopyrimidine (AFB(1)-FAPY) derivative. Both AFB(1)-N7-dG and the β-anomer of the AFB(1)-FAPY adduct yield G→T transversions in Escherichia coli, but the latter is more mutagenic. We show that the Sulfolobus solfataricus P2 DNA polymerase IV (Dpo4) bypasses AFB(1)-N7-dG in an error-free manner but conducts error-prone replication past the AFB(1)-FAPY adduct, including misinsertion of dATP, consistent with the G→T mutations observed in E. coli. Three ternary (Dpo4-DNA-dNTP) structures with AFB(1)-N7-dG adducted template:primers have been solved. These demonstrate insertion of dCTP opposite the AFB(1)-N7-dG adduct, and correct vs incorrect insertion of dATP vs dTTP opposite the 5'-template neighbor dT from a primed AFB(1)-N7-dG:dC pair. The insertion of dTTP reveals hydrogen bonding between the template N3 imino proton and the O(2) oxygen of dTTP, and between the template T O(4) oxygen and the N3 imino proton of dTTP, perhaps explaining why this polymerase does not efficiently catalyze phosphodiester bond formation from this mispair. 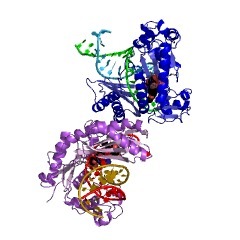 The AFB(1)-N7-dG maintains the 5'-intercalation of the AFB(1) moiety observed in DNA. The bond between N7-dG and C8 of the AFB(1) moiety remains in plane with the alkylated guanine, creating a 16° inclination of the AFB(1) moiety with respect to the guanine. A binary (Dpo4-DNA) structure with an AFB(1)-FAPY adducted template:primer also maintains 5'-intercalation of the AFB(1) moiety. The β-deoxyribose anomer is observed. Rotation about the FAPY C5-N(5) bond orients the bond between N(5) and C8 of the AFB(1) moiety out of plane in the 5'-direction, with respect to the FAPY base. The formamide group extends in the 3'-direction. This improves stacking of the AFB(1) moiety above the 5'-face of the FAPY base, as compared to the AFB(1)-N7-dG adduct. Ternary structures with AFB(1)-β-FAPY adducted template:primers show correct vs incorrect insertion of dATP vs dTTP opposite the 5'-template neighbor dT from a primed AFB(1)-β-FAPY:dC pair. For dATP, the oxygen atom of the FAPY formamide group participates in a water-mediated hydrogen bond with Arg332. The insertion of dTTP yields a structure similar to that observed for the AFB(1)-N7-dG adduct. The differential accommodation of these AFB(1) adducts within the active site may, in part, modulate lesion bypass.